A drought in Ireland after a few days? Do they take us for complete idiots? 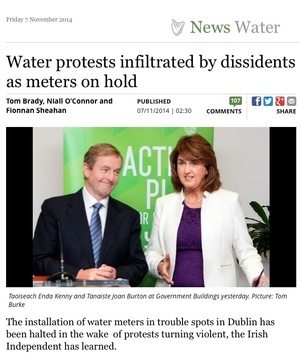 Posted in Misc and tagged Irish Water, Privatisation at 3:15 pm on June 28, 2018 by Bodger. Seeing as we’re not paying for water now, why the aggro? And jaysus, it’s not hard to fathom that there are certain reserves of water, and the traffic is one way on them – out – and potentially higher than normal becuase people consume more water to keep hydrated in this weather, and that’s before you’ve eejts filling paddling pools and watering their plants. Yes, it’s quite amazing that in a country where we’ve so much sodding rain that the reserves are so low but there you go. Like most other entities in this country, the money does indeed go in (for decades in some cases) but nothing ever comes out the other side….maybe it leaked too? Like golf clubs and the serially appalling men and women who use their courses. Building houses on the land would be a start. Well, I would hope that golf courses would scale back their use of water at these times, too. Though they pay for their water, so they already have an incentive to conserve it, unlike domestic users currently. Dinny: Educate yourself, get a few bob in your pocket & then you’ll be able to afford to join a golf club. Otherwise use one of the 3 public courses in Dublin . or possibly, you know, the (unusual) lack of rainfall over the last 6 week and the forecast for a few more weeks of no rain. Let’s reduce pressure now and ensure the supply we have is sufficient.- rather than binging now and having no water to August. How did people like Fergus share their expert hydrological insights before the internet – I guess they just bored strangers in pubs. I believe it has been longer than a ‘few days’ since there has been a significant rainfall event. Where do you think the rain comes from? The water infrastructure in this country is creaking at the seams and needs investment, in the meantime, the general population needs to start conserving the water we do have (I saw an old guy watering his grass with a hose on Monday, madness). Metered water charges kill both these birds with one stone, as well as saving us the fines we are paying to Europe under the polluter pays legislation..
and then we pay water charges. You clearly took the ‘we’re paying by our VAT!’ line and ran with it, but your figures and era are wrong. At the time charging was moved back to direct, the exchequer was in massive deficit so wasn’t able to pay for it. Wouldn’t a couple of billion go a long way towards fixing the pipes? Oh wait – sure a couple of billion has already gone into setting up a company – that issued invoices, but had to refund amounts paid. Yet it’s still there, sucking the taxpayers dry. Noonan and Hogan have a lot to answer for. and all those bonu…. sorry nonpensionable performance-related awards. If you’d paid for the damn stuff there might not be a shortage. But nah, let’s watch Putin’s World Cup on Sky Sports and pay for that instead. Audi are awful value for money. ‘Audi he make that out, so? And driven by complete bellends. Dan. is that actually true about the cars? – genuinely? Google finds this comment and a Journal comment about the Audis. Nothing else. I think some confusion with the (sponsored, zero cost to exchequer) cars for the EU presidency a few years ago. They actually spent it all on that guy who imitates cars. the gaa is on sky sports… not a real sport. Keep em coming, Julie, you’re gold, pure gold. I respectfully suggest that the housing estates where the residents were particularly aggressive towards Irish Water contractors while attempting to install meters be cut off while supplies are low and in order to have services restored they shall have to sit an exam incorporating selected physics, fluid dynamics, engineering infrastructure, capital expenditure budgeting and a few other rudimentary subjects which may enlighten them. Why? Do water meters produce water? Venezuelans have free petrol, note where that’s landed them. Cars don’t run on water – so what’s your point? I’ve been a private sector employee and employer my entire working life, a compliant tax payer that paid my water charges, kids to feed and rear so could always do with some extra funds but am capable of understanding the costs involved in upgrading and servicing water infrastructure. I expect to be working well into my 70’s God willing, your obsession with pensions is pretty narcissistic, ever met the bores ‘enjoying’ their retirement? Maybe you should have to take an exam on Democracy and Civic before you are allowed to comment…. Indeed, let us not plan for any contingency until there is only sufficient water reserves for a few days. To do anything else is just propaganda. Or, God forbid, planning ahead and saving water now? Ah no, you can do your wee wees. Just don’t flush too much. ” If it’s yellow, let it mellow, if it’s brown, flush it down” etc.. There is no circumstance or context where its ok to not flush the jax. We happen to be using July’s reserves in June – hence the conservation advice. That is all. Water is being used at a greater rate than it can be treated and distributed. There has also been 6 weeks of great weather with little interruption. Yeah it’s not like we had solid rain since the last spell of nice weather a few weeks ago. We’re not used to this level of dry weather so it makes sense that our water infrastructure wasn’t built to cope with it. I just don’t get the hysteria. Water is being leaked through the mains which causes a lot of this. no. it is the lack of rainfall that is causing this. In the last 8 weeks my water barrels went from 0 to about 80% capacity which after some quick math works out at about 2mm of rain on that Wednesday morning. Of course someone could just go up to blessington and take a picture, though of course they could be hiding it under the sea. Wait! Could this mean a Holy Water shortage for Pope Frank in Knock and Dublin? This is getting serious. We should all pray for rain. Fergus is being sarcastic, right? If we had made no protest and just paid the charges we would still be here today discussing why we need to conserve water in this dry spell, in other words IW would have done nothing either way, they only want the money and to not spend it on upgrades. We will be fighting IW for ever and a day to put the money paid by consumer into the service. The leak figure of circa 45-50% has not changed much in the last 20 years, again they have done nothing to address that. If they were asking for a water charge for a state of the art water system that always worked, never had crypto-bowel catastrophe in it and had storage capacity for the dry spells then maybe. Currently 6 locations have boil water notices, so the water you have paid for is not fit for touching and for every E100 spent on water network, E40 odd gets pi$$ed away into the ground. What a way to do business. 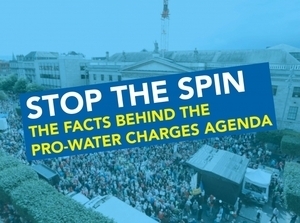 They spent E500,000,000 on water meters, smart water meters to be exact, do they not take data from them and identify the numpties with the pools and the children’s water parties and warn them to desist. The data from those meters is our data and should be released and shared in a transparent manner. 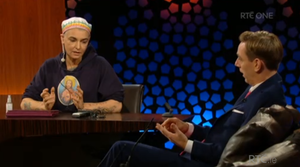 Maybe all that took the refund should donate the money to Irish water ? haahaa. I sea what you did there! Yes – ban golf! And while you’re at it better check they’re not irrigating Croker or landsdowne too, im sure you can come up with more Dinny. Great solution – think I’ll go play nine now – cheers. No rain -no water !